So, how did living in the Forest of Dean lead on to setting-up shop near Cadiz? Well actually the Gimena pen project started when we were based in Spain, but as the Spanish economy got into trouble earlier this decade we relocated to Coleford in the Forest of Dean, when Pablo found a job as a cabinet maker there in 2011. At first, that put a stop to the Gimena project, but via the Writing Equipment Society Pablo involved in a pen repairing course and made some good contacts along the way. That introduction to the vintage world soon led him to start repairing pens. About a year later we returned to Marbella, Pablo brought his tools and lathes from Ronda where he’d stashed them so he could continue working on Gimena pens, and we developed the Ebenus and Amaranthus models. 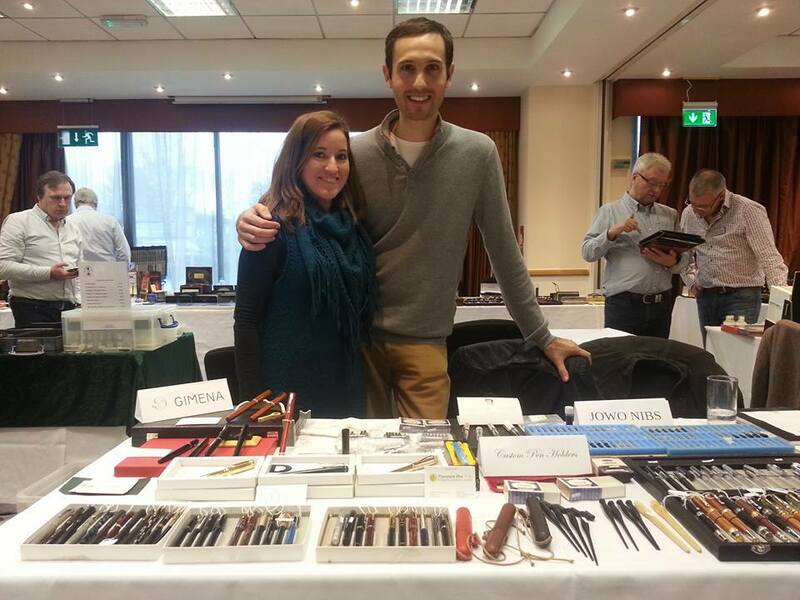 We also kept going with pen repairs and started selling nibs then too. In early 2015 we moved from Marbella to a new workshop in Jimena de la Frontera, near Cádiz; we were very lucky because it was a bargain in a great location that many Brit’s people know well. From that moment too we started working on both Gimena and FPnibs.com full time. What got you both started in fountain pens? In 2008 we had a shop in Ronda where we sold hand made wooden products that we made by ourselves. Someone who came to the shop talked to us about kit pens, so we started to make some, but many people asked for fountain pens and that was the beginning. Then we realised that pen collectors and users prefer non-kit pens, so Pablo started designing whole pens. Tell us more about the Gimena brand; what inspired the choice of materials and what’s coming next? As you now know, Pablo has loved wood since he was a child so there was no other material his pens could be made of! Then we thought that, as a hand made product, all the other parts should be of high grade and quality – there’s no sense to working for hours with bad materials, so bronze, silver and gold were selected. The Gimena project is very exciting to be part of; from the design to the finished pen it is a beautiful procedure that makes us very happy and proud. We still enjoy innovating, too, so there are new designs in the pipeline. We would like to offer cheaper pens than the Gimena range, but maintaining the same quality and is a challenge. 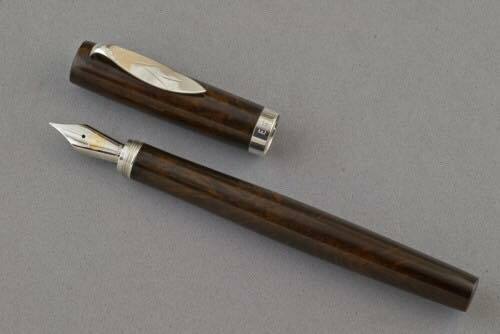 Some customers have asked us to make oblique dip pens, and we have made some and we enjoyed making them so much we are planning to offer some other models too. Via FPnibs.com we have started offering dip pen nibs as well as pen holders as calligraphy is a world that we would like very much to get into. How did you move into selling replacement nibs – and which is the most popular? For the Gimena pens we needed nib units as that is the only part we do not make, so JoWo asked us for a minimum quantity order. That was very high so we ended up with a lot of nibs, more than we could sell with hand-made Gimena pens. That is why we thought we could sell some and get a little bit of money to help start the Gimena project. The size 6 is the king of the nibs – both solid gold and steel ones sell very well and the most ordered finished is two-tone. People tell us they perform perfectly! Your gold replacement nibs for TWSBIs are becoming very popular – are there other types of pens you’ll be providing gold nibs to fit soon? 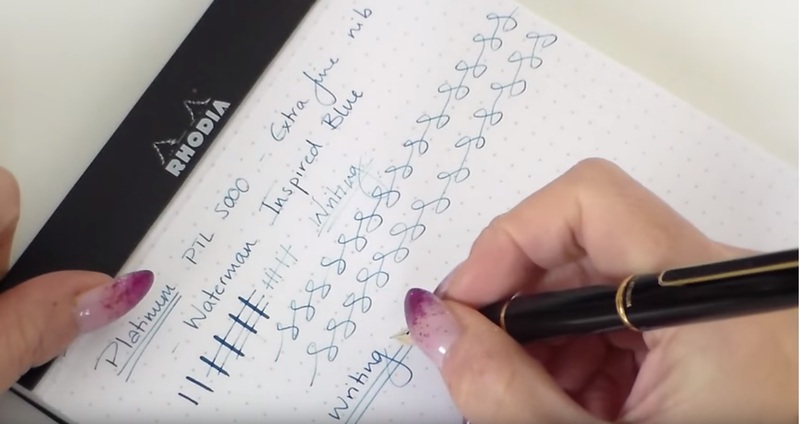 That was something we were asked continuously – does any of your nibs fit in a TWSBI model? There was some information on the net about pens that claimed to do so, but we preferred to try by ourselves and bought the 700, 580, Mini and Eco models, and once we tested each JoWo nib we could offered them sure that they will fit properly. If you look at Pablo’s videos on YouTube you’ll see there are other pen makes we’re testing nibs for too. So now the big question: what pens do you write with yourselves? Esther uses an Onoto de la Rue with a purple ink, which is quite ‘dirty’ but a nice colour. Pablo normally uses a Gimena prototype in Ebony wood untreated, so he can test the longevity of this kind of pen. And we both have inked a Pilot 74 with a fude style nib and an unbranded jeweller’s vintage fountain pen with a very nice flex nib that sit on our desks, and we use those randomly. If that’s whetted your appetite, it’s worth look at the Gimena pen site and, of course, the very handy replacements at FPnibs. Next week, we’ll be reviewing one of the other rather special pens which Esther and Pablo also sell! A bit of history Diamine have been making a splendid range of inks in Liverpool since 1864, and as well as their own extensive branded range of fountain pen refuelling solutions, they occasionally make an ink or two specially for another company, pen manufacturer, or indeed anyone who asks nicely and stumps up the cash. Fine examples include the series they used to make for Conway Stewart, the handsome collection cooked-up for PW Akkerman, and indeed the eponymous SBRE Brown. You can hardly blame the mighty Cult Pens team for getting in on the act – and so, starting with a nice rich blue, they have gradually developed a striking collection of inks which do just what they say on the bottle; they’re deep, they’re dark, and, well, inky. Deep Dark Blue kicked-off the collection, with the aim of getting a blue similar that in the Cult Pens logo. It looks a bit darker than that when it first goes on to the paper, but dries to a dark blue that is just on the blue side of blue-black. ‘Probably an ideal choice for writing with at work if you want something suitably sober but still more interesting than standard ‘school’ blue. It’s good stuff, which Stuart declares his favourite deep blue ever, and you can watch Ian put it through its paces here too. Deep Dark Brown is as far as dark as brown can go without becoming black really, but Diamine have pulled it off. If you ever need to dash off a quick facsimile of the Magna Carta, then this is probably the ink for you – although if you can also write more legibly than those thirteenth-century scribes that would be greatly appreciated by constitutional law experts the world over. Deep Dark Red is almost a must-have ink, especially if you want a red ink which you can legitimately use at work without being mistaken for a very unimpressed teacher. It manages to stay red without fading into brownish hues, as Oxblood tends to, and rather surprisingly it’s Scribble’s favourite (purple fans may now need a little sit-down to recover). Ian loves this one too. Deep Dark Green provides seems a logical addition to the mix, although we’re struggling to think of many occasions when it would be the ideal choice. In the dusty corridors of Whitehall, writers of incendiary letters of complaint to ministers are traditionally known as missives from the ‘green ink brigade’, and rare as it is for governmental correspondence to be issued in any sort of fountain pen ink at all, this seems right for the job. Green ink is also still used by the chief of MI6, but it’s going to take C quite a while to get through the whole production run of this ink without some assistance… Deep Dark Purple has been one of the star turns in Scribble’s over-the-top Too Many Purples mega-review, and for good reason; purple ink obsessives need something which they can get away with using at work! This one has a special trick up its sleeve, too – if you really pour it onto the page you’ll notice a striking green sheen floating to the top, and it’s quite a sight. Deep Dark Orange seems like a tall order, and the risk of smudging into a light brown must have been a seat-of-the-pants ink-blending challenge, but they made it (in both senses). Somewhere between Pumpkin and Ancient Copper, if you know your Diamines, this ink has impressive shading in the right nib. A bit of a connoisseur of all things orange, even Ian was impressed. What next? Cult Pens are working on the understanding that this collection is now complete, and with six stonking inks who can blame them? But then again, if Deep Dark Orange is possible, surely Deep Dark Turquoise should be! Here’s a mock-up of how that could look, mixed from Havasu Turquoise and 1864 Blue-Black, but the boffins at Diamine could do it so much better. What do you think? Getting hold of a refill is a simple enough job since all three of the standard Diamine packages are available; pre-filled international cartridges, 30ml sample bottles or the classic 80ml glass flagons. Better still, until the end of March 2016 you can get a 10% discount by going to the website and using this code: CULT10 (remember to enter it in capitals). If you want to see even more you can Scribble’s hand-written review and Ruth’s video review too! A little bit of history Once upon a time there was a little birdy, and it flew away. 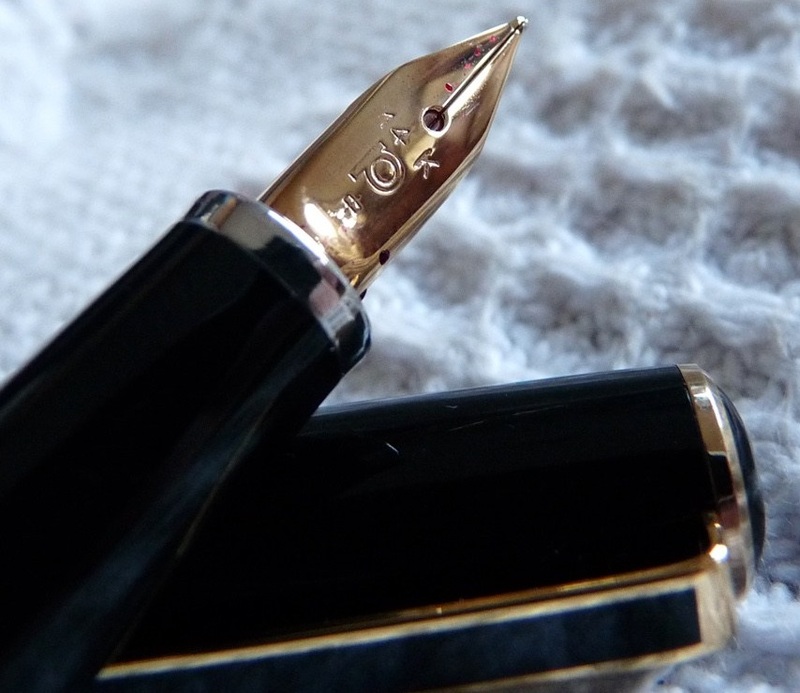 We refer of course to the Pilot Birdie fountain pen, which by all accounts positively flew off the shelves, and which has sadly now flapped off into oblivion. But that missing link in the fountain pen family tree has now been filled, thanks to a remarkable collaborative effort by Cult Pens and Kaweco. With two names we know and love already involved, we naturally had to check it out. How it looks The current version has a brushed grey aluminium finish which, as Ian points out, is more than faintly reminiscent of 1970s design, but in a good way. If it wouldn’t look out of place clipped into a boiler-suit pocket donned by one of Blake’s Seven, well who are we to complain? How it feels Solid, and well-screwed-together – but small. There’s no getting away from that issue; it is big enough for scribbling quick notes, but most people will find it just a bit too petite for extended writing sessions. That suits its function, though; this is a pocket back-up pen, and it does that supremely well. How it fills A small international cartridge is the most sensible option. In principle, the short Kaweco squeeze converter also fits, but we recommend syringe-filling cartridges rather than bothering with the latter option – the diminutive ink capacity doesn’t justify the inconvenience. 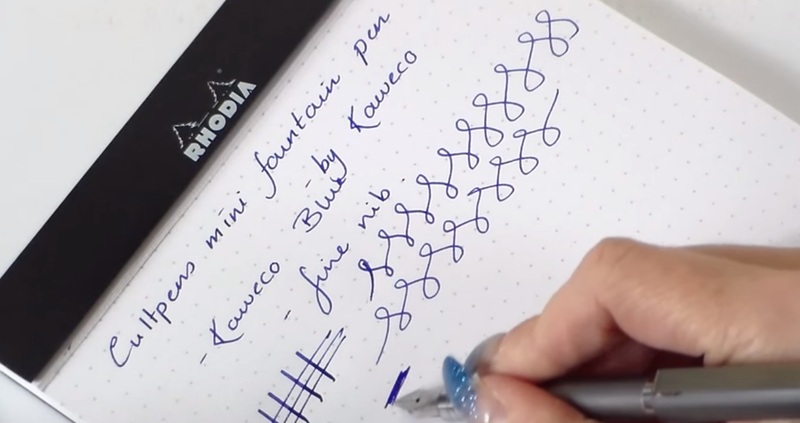 Crucially, how it writes… That depends upon the nib, and there’s quite a choice; all of the smaller Kaweco units screw in (or out) as suits your requirements. The wider italics have a habit of running rather dry, but the standard round nibs are usually pretty good. You could even go crazy and bolt on a gold nib, if you want to! Pen! What is it good for? Keeping in the pocket as a back-up, of course. Oh, and looking cool – although of course that’s never a consideration for us deadly-serious fountain pen connoisseurs, ‘honest Guv. VFM Pretty good. It’s not dirt-cheap, but the components are well-engineered and it will take a good bit of knocking-about – so decent value, in our view. If this isn’t quite your cup of tea, but almost… One of Kaweco’s own small models may be worthy of consideration; this is somewhere between the Lilliput and the Sport in size. 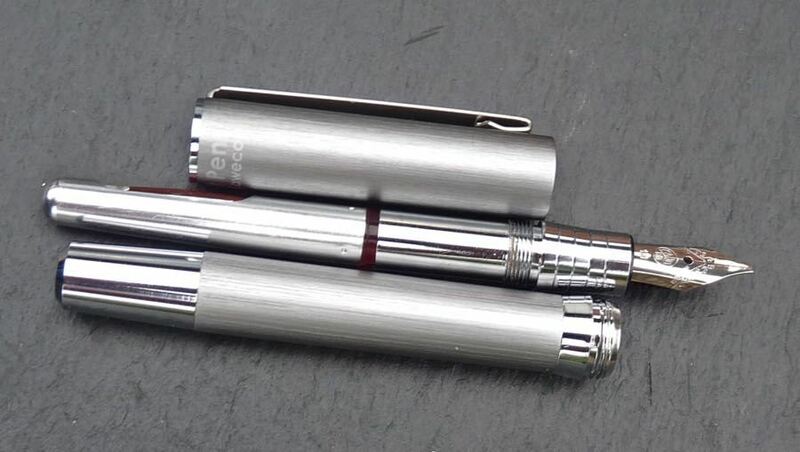 Our overall recommendation If you need a metal pocket pen and don’t want to spend a fortune, give this a try! Where to get hold of one Cult Pens, obviously – and until the end of March, you can get 10% off with this code: CULT10 (make sure you enter it in capitals). Incidentally, that code also works for Cult Pens’ other ‘own-brand’ specials, including the Deep Dark inks which we’ll be turning our attention to next week. Thanks to Cult Pens, for providing review samples and that handy discount code. 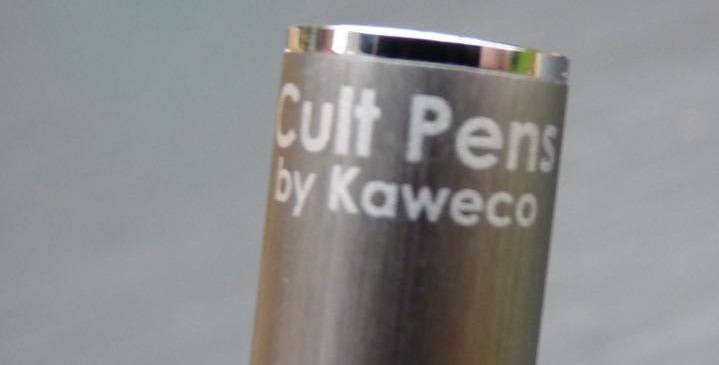 Cult Pens are one of the best-known names in fountain pen retail (and various other goodies) in the UK – and, as it happens, one of the earliest supporters of this site, although we were all customers already. So when we decided to broaden the format of the United Inkdom to include the occasional company profile piece, they were a natural choice to get us started with that too. We caught up with one of the company’s founders, Simon Walker, for a very light grilling. How did it all get started, and how has it changed? Well that’s been pretty well covered elsewhere, but it was the classic evolution from a small shop to early e-merchandise, and on to today. Getting the software to work well is a lot easier these days, and it’s grown from a couple to eighteen people – and a dog, of course! Herbie the Cult Pens despatch hound, hunting the famous Dartmoor tiger. What brands have been the big hits – whether or not they were expected to be? Kaweco stand out as fellow stationery fans, and they’ve been great to work with – their success has really come from listening to customers and shaping their offer accordingly, which fits well with works for us too. The other big brand that stands out is Platinum; they too have really listened to customer feedback and put time and effort into understanding what writers are looking for – when you see the chief executive of international big name like that making it all the way to Devon to meet us, you know they’re serious! 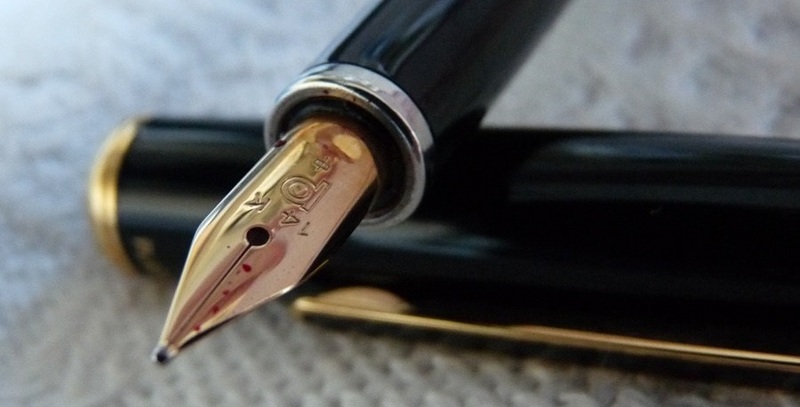 How is the humble fountain pen holding up against its competitors? The biggest competitor these days isn’t really another writing device, but the smart phone and the tablet. It sometimes seems like hand-writing implements as a whole are a declining market, so enthusiast markets are the key. That’s fine by us though – the enthusiasts are really nice people to work with, and it all drives innovation. So, what should we look out for next? Oh, now there’s a trade secret! Actually the big new releases should be starting to crystallise fairly soon; it’s the big trade show coming up soon in Frankfurt where the latest models and designs start to get shared. We’re hearing rumours about some significant new products from some very well-known names, but ‘watch this space’, as they say. What do you write with every day? Honestly, I’m more of a mechanical pencil obsessive! But the rest of the team are all keen on putting the latest opens through their paces; the Decimo is putting in some miles at the moment, for instance. How is your Cult Pens ‘own brand’ line developing? We had to leave Simon to get back to running the ship at this point, but not before setting up exactly the follow-on you’d expect – so look out next week for a United Inkdom meta-review of the Cult Pens mini fountain pen.